To design a contemporary brand identity that would emphasize the Classic Cocktails brand as a modern and fresh but still elegant business. •	Classic Cocktails is a young business that needs to be presented as classic, but still fresh and modern. •	The logo should have some cocktail related artwork in its design. • We needed to use red in the logo, per client’s color request. The approach was to present a front that embodies elegance, assurance, experience and quality. With the brief outlined we started putting together a set of concepts that combined fonts and graphics. We also knew that the company name would have an optional tagline to go with the logo when needed. We designed 3 different options for the client to choose from. The customer requested a variation of the chosen logo by adding a tagline to one of the options and was ready to move forward to the business card design. We needed to design and print business cards with the newly designed logo after the client’s approval. The front of the card had to display the logo and the vital contact information. 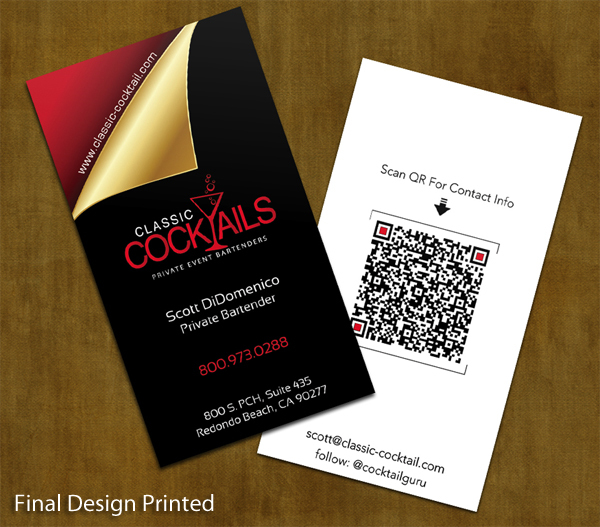 We decided to design the back of the card either as a notepad or to place the QR (quick response) code that points mobile devices to customer's vCard (electronic contact info). In both cases we wanted the back of the card to be somehow useful and not blank. The design process took no longer than two days and we came up with two different options for the customer to choose from. 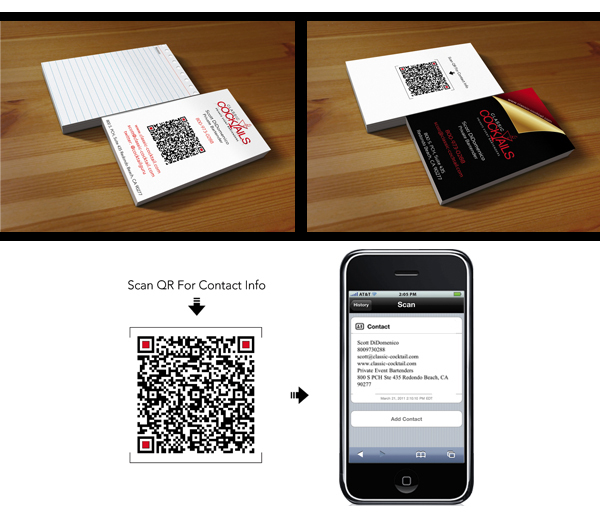 To learn more about QR codes see "The Use of QR in Print and Advertising"
The customer identified the design he wanted to have finalized and after a couple of adjustments the design was approved for print. We picked our 16 PT thick paper stock and had it laminated on the front, which was the best solution and matched the card in look and feel. The back was left matte for a better QR-Code scan. Need help with your project? Contact us anytime.